Good readers of Lantana! Do not disregard a desire to read books, yes books, even if you feel embarrassment or disquiet that you read books far less now than you did ten to twenty years ago. David Ulin, LA Times book critic, may have some insights for you. Sometime in the last few years—I don’t remember when, exactly—I noticed I was having trouble sitting down to read. That’s a problem if you read, as I do, for a living, but it’s an even bigger problem if you read as a way of life. That resonated with me, as I’m a teacher, a librarian by educational background, and a reader for enjoyment, too. I also like Ulin’s insight that reading is really a journey of discovery, an excavation of our inner world, even if it doesn’t seem to be ours (the readers’) at the beginning. Ulin observes it’s important to “take the plunge” and to remember that the writing we read is a kind of interaction. A sort of give and take, perhaps, a push-pull relationship, a lurking played out in silent intimacy? Hmmm-hmm. Ulin sets forth the sources of his distraction (much of which will be familiar to you as it is to me — internet, the 24 hour news steam, etc.). Then he narrates, albeit meandering at times, a personal essay of how reading can be rediscovered. He seeks to help his technology-savvy teenage son enjoy Fitzgerald’s The Great Gatsby. His son in turn helps Ulin recognize a kind of interactivity and connectivity in the on-line chatting, lurking, browsing, and scanning of search engine results, websites, Facebook posts, e-mails, and e-readers. 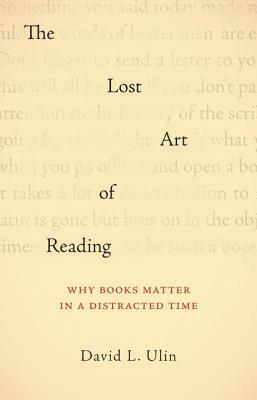 Beyond that, though, Ulin is able to rediscover the pleasures of reckoning with time and slow, long form reading, for he claims that what we read inhabits us and we animate it in turn. He also enlists the help of Fitzgerald, Thomas Paine’s Common Sense, and a host of other modern writers and thinkers to help him (and us) rediscover reading for pleasure.